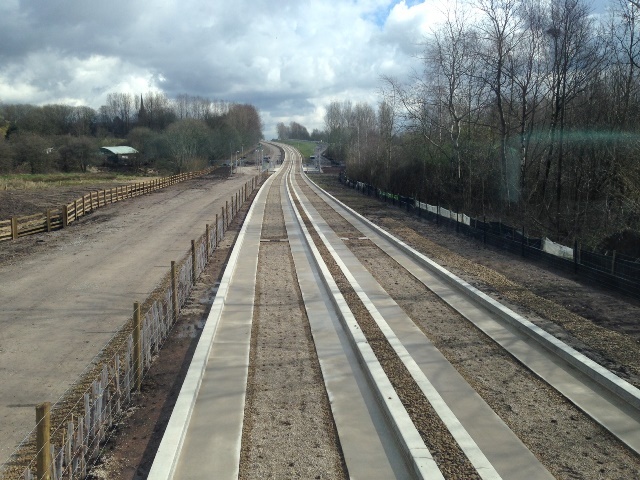 The North West’s first guided busway opens today Sunday 3rd April. The 4.5-mile bus-only guideway between Leigh, Tyldesley and Ellenbrook provides super-smooth, rapid connections for passengers thanks to a unique concrete track. It forms the flagship element of Transport for Greater Manchester’s bus priority investment, a £122 million overall package enabling people to enjoy faster, more punctual and more reliable bus services across the region, to, from and through the city centre. 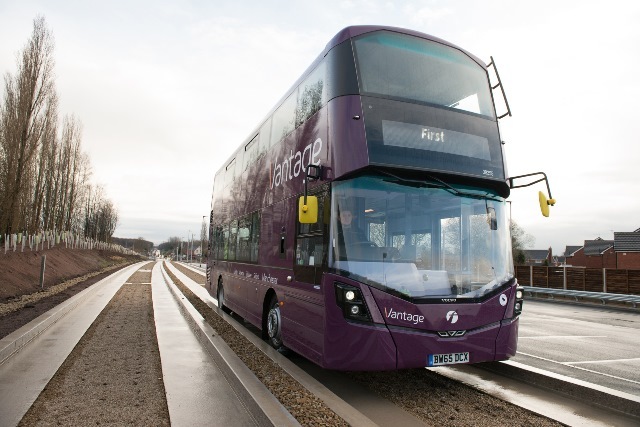 Operated by First Manchester under the brand Vantage, a fleet of 20 new, bespoke, state-of-the-art buses will connect Leigh, Atherton and Manchester in as little as 50 minutes. Passengers travelling between Leigh and Manchester previously faced journeys timetabled at up to one hour and 20 minutes. The high-specification, low-emission hybrid buses have Wi-Fi and USB charging points, plush seating, audio and visual stop announcements and climate control. The seven purpose-built stops along the busway will have real-time travel information display boards, CCTV, a public address system and covered cycle parking. Busway services will start as early as 4am and run beyond midnight, with up to eight buses an hour between Tyldesley and Manchester. The investment includes three new park and ride facilities, catering for more than 400 cars in total, and a specially surfaced shared path alongside the busway which can be used by walkers, cyclists and horse riders. “Being able to finally welcome passengers aboard is a marvellous milestone in our commitment to make travel easier for everyone. “By prioritising buses we not only make journey times quicker, more reliable and more attractive for passengers, we also help to tackle congestion and reduce emissions. “Completion of the busway is a major technical achievement and our investment promises a significant boost for all the communities it serves, helping people reach key employment, healthcare, and retail and leisure facilities more easily than ever. I am grateful to those communities for their patience while the scheme was being completed. The busway links to bus priority routes along the A580 through Salford, with the remaining bus priority work currently taking place to the south of Manchester city centre along Oxford Road. The city centre works are themselves part of a £1 billion investment to ‘future-proof’ the transport network and support the regional economy. “The opening of the guided busway signals a new chapter for transport in Wigan Borough. “The busway will bring a huge economic boost to the borough and means thousands of residents now have a convenient and low-cost transport connection on their doorstep. “Our residents living in the east side of Wigan Borough will now be able to access new employment and training opportunities more effectively and efficiently. "First Manchester is proud to be working with TfGM, Wigan Council, Salford City Council and Manchester City Council in delivering the North West's first guided busway. “First Bus has a great track record of working in partnership to develop successful initiatives to grow bus use. I'm sure this busway will attract people onto public transport and help relieve congestion and support connectivity for people to places of employment, leisure and education.